These images from NASA’s Cassini spacecraft show one of the large seas and a bounty of smaller lakes on Saturn’s moon Titan. 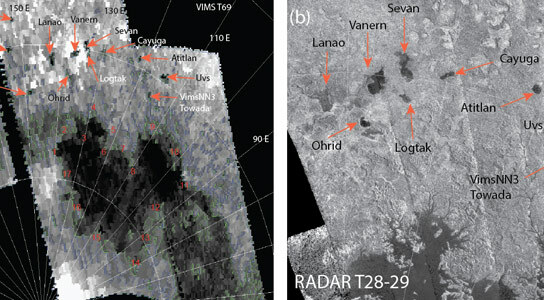 Scientists saw these small lakes in data obtained by both Cassini’s visual and infrared mapping spectrometer (left) and radar instrument (right). Ligeia Mare, about 50,000 square miles (125,000 square kilometers) in area, is the large lake near the bottom of both images. Three new lakes of about 100 to 300 square miles (a few hundreds of square kilometers) identified first in the visual and infrared mapping spectrometer images are labeled in the annotated version as Freeman (VimsNN1), Cardiel (VimsNN2) and VimsNN4. The new lakes can be seen at the top left and middle right. The small lake Towada first seen in radar images was also seen in this VIMS investigation (VimsNN3) and can be seen in the middle right. Based on Cassini data, scientists believe that Titan’s methane-based hydrocarbon features may be passing phenomena, the after-effects of a gigantic outburst of methane released from Titian’s interior eons ago. By tracking a part of the surface of Saturn’s moon Titan over several years, NASA’s Cassini mission has found a remarkable longevity to the hydrocarbon lakes on the moon’s surface. A team led by Christophe Sotin of NASA’s Jet Propulsion Laboratory in Pasadena, Calif., fed these results into a model that suggests the supply of the hydrocarbon methane at Titan could be coming to an end soon (on geological timescales). The study of the lakes also led scientists to spot a few new ones in images from Cassini’s visual and infrared mapping spectrometer data in June 2010. Titan is the only other place in the solar system besides Earth that has stable liquid on its surface. Scientists think methane is at the heart of a cycle at Titan that is somewhat similar to the role of water in Earth’s hydrological cycle – causing rain, carving channels and evaporating from lakes. However, the fact that the lakes seem remarkably consistent in size and shape over several years of data from Cassini’s visual and infrared mapping spectrometer suggests that the lakes evaporate very slowly. Methane tends to evaporate quickly, so scientists think the lakes must be dominated by methane’s sister hydrocarbon ethane, which evaporates more slowly. The lakes are also not getting filled quickly, and scientists haven’t seen more than the occasional outburst of hydrocarbon rain at the moon over the mission’s eight-plus years in the Saturn system. This indicates that on Titan, the methane that is constantly being lost by breaking down to form ethane and other heavier molecules is not being replaced by fresh methane from the interior. The team suggests that the current load of methane at Titan may have come from some kind of gigantic outburst from the interior eons ago possibly after a huge impact. They think Titan’s methane could run out in tens of millions of years. For more information on this finding and the lakes, visit http://saturn.jpl.nasa.gov/news/cassiniscienceleague/science20130412/. The Cassini-Huygens mission is a cooperative project of NASA, the European Space Agency and the Italian Space Agency. The Jet Propulsion Laboratory, a division of the California Institute of Technology, Pasadena, manages the mission for NASA’s Science Mission Directorate, Washington, D.C. The visual and infrared mapping spectrometer team is based at the University of Arizona, Tucson. Be the first to comment on "Titan’s Methane May Run Out"